After promising ourselves a new mattress for about five years we have finally got around to it! On our first boat, Alternative Therapy, the bed was a custom made, extendable affair with a memory foam three piece mattress. As comfortable as this was, it was a pain having to fold the bed out and then away every night and morning, the only sheets that would fit were super king size (super expensive) and I dread to think how much it would have cost to replace when the time came. Thankfully the bed under the tug deck on our current vessel is a futon style under the tug deck that takes a standard double. When we moved aboard nearly five years ago we brought the mattress from home, even though it was getting due for replacement. Every Christmas since, we planned to go mattress shopping during our holiday and this year we managed to actually do it. Although we have never had any trouble with mould or condensation, we had seen a product advertised that has been designed specifically for boats where air flow is restricted and thought it prudent to invest in some. It is a barrier layer that is ideal where the mattress has a solid base. 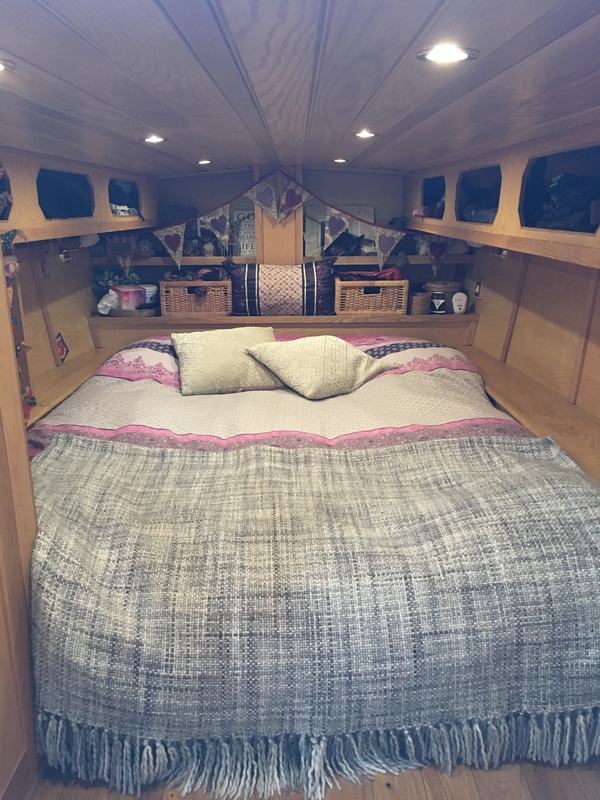 We do have slats with a decent gap above the floor but the bed is enclosed on three sides and the water tank is situated behind the head board. In winter this can create cold air and possible dampness as the warm air from the boat spreads under the tug deck. There are a couple of complications in getting a mattress onto a narrowboat! Firstly is getting the mattress to the boat. Luckily we are currently on our winter mooring so we could drive down within a reasonable walking distance. (As an aside, we were also fortunate to be able to have it delivered to our workplace and I have a van). Secondly, the hatch! As in, the hatch is smaller than the mattress in all directions. Not wanting to do any damage it was rather a struggle to bend and shove but we managed in the end! It was certainly a damn sight easier than when we had to replace the fridge (see blog post here). We manhandled the old one out and all that was left was to put lovely new bed sheets and duvet. Oh and then get a good night’s sleep! Looks great, Megan! What a good idea that anti damp mat is. I’ll ask you about that on FB, but well done. It looks a lovely snug place!